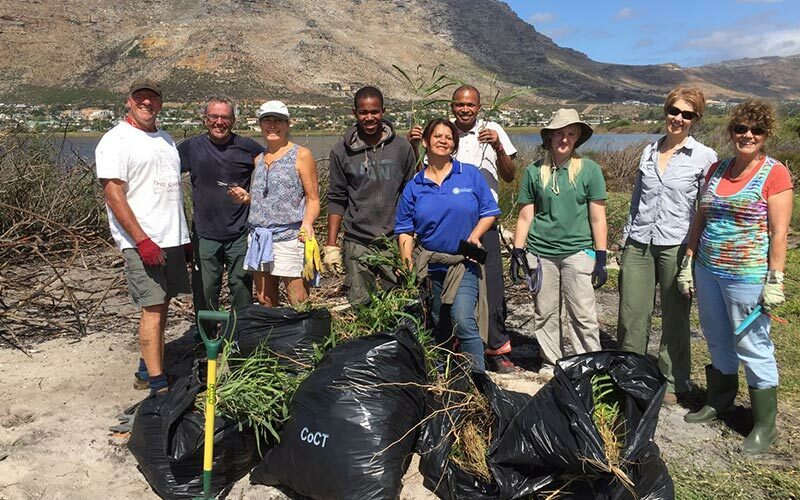 Zandvlei Trust members have regular monthly clean up events where they clear invasive species from the Zandvlei Nature Reserve – they have been doing this for more than 25 years. Removing invasive plants promotes the biodiversity of all living species including insects, reptiles, amphibians, mammals and birds. The last remaining natural vegetation areas within the City are under extreme pressure from human development. Our natural areas need linking corridors of local indigenous vegetation to remain viable for the free movement of all creatures and the distribution of wind dispersed seed. Invasive vegetation often dominates and suppresses indigenous plants. They grow quickly, using large amounts of water and also create a shade canopy preventing sunlight from reaching the ground, where the low growing, bulbs and seedlings struggle to thrive in low sunlight. When : Every 2nd Saturday of the month in the afternoon starting at 2pm. Wear old clothes with long pants, boots or comfortable old shoes. Bring a hat, sunscreen, garden gloves and suitable outerwear for all weather conditions. If you have garden loppers or a small bow saw bring it along with you. The instructions and training information required will be given to you (before and during the afternoon). Contact : Gavin Lawson 021 705 5224 for more information.